BEIJING -- A compact SUV concept that hints at Audi’s fifth SUV model most likely will carry a name under the TT family, rather than Q4, as previously reported by some media. The TT Offroad Concept unveiled here Sunday could become the fourth derivative of the TT family, possibly called the TTQ, people familiar with Audi’s plans say. The car is expected to be produced in about two years. Ten years ago, Fiat’s Alfa Romeo brand used the Q4 suffix for the four-wheel-drive variant of its 156 wagon. Alfa later used Q2 for front-wheel-drive variants of the 156 with an advanced anti-spin system. For the same reason, Audi’s subcompact SUV, due next year, won’t be called the Q2 as previously reported, but rather the Q1, company sources told Automotive News Europe at the Beijing auto show. Audi's production version of the sporty four-door compact SUV would be underpinned by VW’s Group MQB modular architecture. It will be similar in size to the Q3, but will compete with sportier entries such as the BMW X4 and Porsche Macan. The production TTQ would extend Audi’s Q range to five models -- in addition to the Q1, Q3, Q5 and Q7 -- and the TT range to four models. At the Geneva show in March, Audi unveiled the third-generation TT coupe. Its roadster variant is scheduled to debut in October at the Paris auto show. The third TT variant, whose timing has not been announced yet, will be a two-door sporty wagon previewed by the Allroad Shooting Brake concept that Audi unveiled at the Detroit auto show in January. “The Audi TT offroad concept provides a glimpse of how we might imagine a new model in the future TT family,” said Ulrich Hackenberg, Audi's board member for technical development. 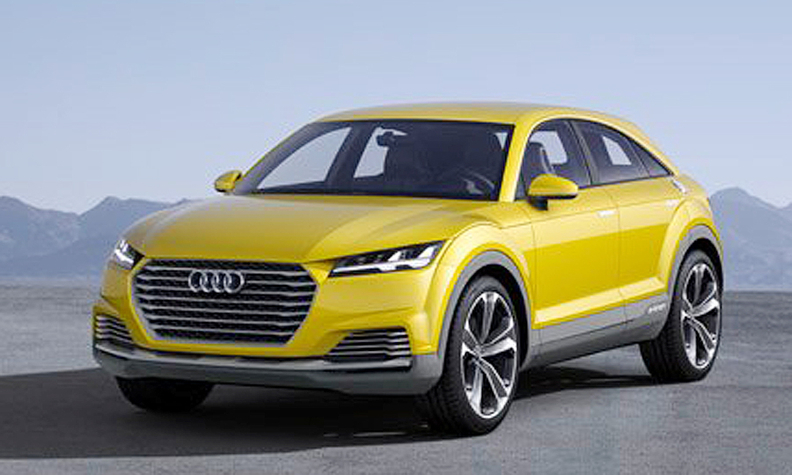 He added that the concept combines the sporty genes of the TT with the strengths of a compact SUV. "We chose to present the Audi TT offroad concept in China, our second domestic market, because it represents the urban mobility of tomorrow: It is sustainable, dynamic, intelligent and connected," Hackenberg said. Hackenberg, who developed the first-generation TT, is the main supporter at Audi behind naming the BMW X4 rival the TTQ, sources said. The TT Crossover Concept’s plug-in hybrid drive system combines a 2.0 TFSI gasoline turbo engine producing 292 hp with two electric motors for a total output of 408 hp. The huge 650 Nm (479.2 lb ft) torque coming from the combination of an internal combustion engine with two electric motors generates almost sports car-like performance. Audi said the show car accelerates from 0 to 100kph (62 mph) in 5.2 seconds and can reach an electronically governed top speed of 250kph. The Audi TT offroad concept can drive more than 50km (about 30 miles) solely on electric power and, with zero emissions, and has a total range of up to 880km, the company said.